courtesy of Ina Garten – trust me, these are amazing! Use a mortar and pestle to mash the mint leaves. Remove and discard the rind and seeds of the watermelon. Put the fruit into a food processor fitted with the steel blade and puree. Put the mashed mint into a large pitcher with 2 cups of pureed watermelon, the rum, simple syrup, and lime juice and stir to combine. Pour the mixture into a pitcher for serving. Place ice cubes in 6 glasses and pour the mojito mixture into the glasses. 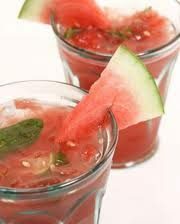 Garnish with sprigs of fresh mint and spears of watermelon. Serve ice cold. Note: to make simple syrup, put 1 cup sugar and 1 cup water in a small pan and simmer until the sugar dissolves. Chill. I’ll go with preparing in advance a perfect frozen margarita (sort of gold in color to go with the school colors!) and transport in a thermos.